For the “free response” part of their AP exams, students are given green booklets that contain the questions and pink booklets in which to write their answers. They can scribble whatever they wish in either book, but the pink ones get sent off to be scored while the green ones end up in my file cabinet. How do I know which ones should end up in my file cabinet? The students write their names on them, and just underneath their name, they’re supposed to write their teachers’ names. This is were things get mildly amusing. My Great Burden on this Earth is that of having a name that is often misspelled and mispronounced (I have misspelled my name just once ever, just to prove that I could). Well, this year’s batch of green booklets featured the most diverse array of misspellings I’ve seen yet. I was compelled to tabulate and analyze data. I wish I knew an algorithm for determining variance from a correct spelling so I could start measuring how far off these misspellings were. Alas, I’ll have to make do with simple percentages and pie charts. 53.7% of my students managed to spell my last name correctly. Juniors were twice as likely as seniors to spell my last name correctly (77.6% vs 38.2%). Seniors were just under twice as likely as juniors to use that nickname (10.1% vs. 5.2%). A college buddy once proposed that as a test of competence, voters should have to correctly spell the name of the person they wished to elect. If that ever came to pass, I think I’d have to change my last name to “V” in order to win anything. But then I wonder how many folks that would confuse. I had planned to show percentages next to the misspellings. There were six misspellings that showed up once each. Excel rounded three of those misspellings up to 2% and three of them down to 1%. I don’t know if that’s Bill Gates’ fault (Excel) or Steve Jobs’ fault (the MacBook’s processor). While weird, it may mean that Excel forces the percentages to add up to 100 when doing a pie chart. This is compounded by rounding to the nearest percent. Since 1/68 is about equal to 1.47%, rounding down all six 1/68 entries to the nearest percent gives a pie chart where the total is 97% instead of 100%. As a result, the program rounded up half of the six 1/68 entries to get a total of 100%. Based on that reasoning, blame it on Steve Ballmer. Bill Gates is no longer in the loop on Excel. I originally memorized your name by quietly pronouncing it Vis Car I Ello, prounouncing the I, as in Spanish, as “ee”, whenever I visited your website. Yes, this website helped me learn how to spell your name…would be interesting to see how many of the correct name spellers visit this site and the frequency of their visits (more frequent visits leading to a higher accuracy in spelling). But if you’re wondering, I DO pronounce your name correctly in conversations. How many students spelled their own names incorrectly? On a tangent, why does everyone pronouce Brett Favre’s name as Farve? 1. 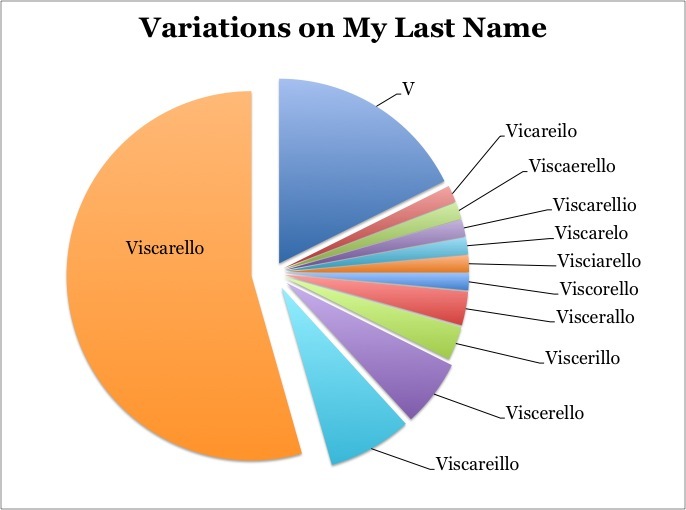 A 1998 joint study by the Copenhagen Institute of Phonetic Studies and DARPA revealed that pronouncing the “ee” adds, on average, 0.14 seconds to the pronunciation of “Viscariello.” I’m trying to save myself and the world some time while maintaining the character of my last name. 2. As far as anyone can remember, that’s not how our immigrant ancestors pronounced it. They pronounced it “vis-car-ell-oh.” So I find it a little weird to alter the pronunciation of your last name because you think your grandparents or great-grandparents– actual speakers of the Italian language– got it wrong. OK. I’m just getting around to reading this. Is the 53.7% that spelled your name correctly designated by the orange segment? I assume that in that segment was the one time you misspelled your name. Very funny. The kids who spelled it correctly do not show up in the pie chart at all. It only shows kids who misspelled it. It is merely coincidence that the orange segment is ~53% of all misspellings.